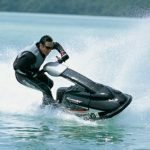 The safety of the recreational boater hasn’t been compromised in the aftermath of the September 11, 2001 terrorist attacks aimed at New York City and Washington, DC. Americans were asked to carry on, enjoy their leisure time, and not let terrorists or terrorism alter the way in which we live our lives. By just being on our waterways, you become an integral part of Homeland Security. When you are out on our nation’s waterways, you can see, you can hear, and you can report things that may seem suspicious to you. This kind of citizen vigilance makes it extremely difficult for terrorists for succeed. Keep your boat secure and locked when not in use. This includes when you visit a marina, waterside restaurant, or friend’s dock or pier. Never leave your boat accessible to others. 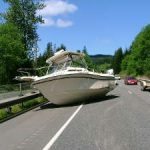 When storing your boat, make sure the boat is secure and the engine disabled. If it’s on a trailer, then make the trailer as immobile as possible. Do not stop your vessel or anchor beneath bridges or in channels. If you do, expect to be approached and possibly boarded by law enforcement officials. Observe and avoid all secure areas. If you don’t know where these areas have been designated, check with local law enforcement or the Coast Guard. Do not venture into commercial port operational areas, especially those that involve military, cruise line, fuel, petroleum, hazardous materials or other inventories that may be a target of terrorist activity. Do not approach military, cruise line, or commercial traffic. Keep your distance. There is a 100 yard security zone around these type of vessels, and the penalties for violating that security zone are severe. Report all suspicious activity to local law enforcement authorities, the Coast Guard, the port or marina security, the National Response Center, or to all of those. Do not approach or challenge any person or vessel acting in a suspicious manner. Filming or taking photos or videos of bridges, tunnels, ferry transport systems, fuel docks, ships, or power plants. Dive operations near ships, bridges, water intakes, or other structures. Recovering or tossing items into the water or on the shoreline. Signaling between boats or ships or to shore. Unattended boats, or access of a boat by force. Tranfer of people or goods between ships, or between ships and the shore outside of a port. Missing or broken fencing or lighting around facilities. Unusual night operations, particularly near bridges, tunnels, power plants, water intakes/treatment plants, oil or chemical facilities, fuel docks, and military bases. To report suspicious activity, contact the National Response Center at 1-800-424-8802. 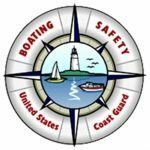 The Coast Guard wants boaters to know that safe boating this summer means more than a life jacket and distress horn – it means staying away from warships and potential terror targets, or they could get blown out of the water. The Coast Guard has drawn up new rules establishing protection zones around Navy ships and power plants as a precaution against terrorism. 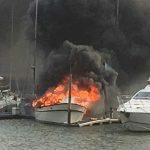 The new restrictions say recreational boaters must slow to minimum speed at 500 yards away from a ship, and stay at least 100 yards away unless they are granted special permission. “Before you get too close, we’ll try to raise you on the radio,” said Jim Karr, a senior U.S. Coast Guard officer. If need be, the Coast Guard and Navy are authorized to use lethal force against a boat that gets too close. Before Sept. 11, that was unimaginable. Now the Coast Guard says it is not. But crew on board ships have just seconds to make that call. “A vessel traveling 35 miles per hour — in 24 seconds he will be in the 100 yard zone. And six seconds later the commanding officer of that naval warship has to decide whether or not to use deadly force,” said Karr. The rules went into place after Sept. 11, for the first time since World War II. Before that there were occasional security zones for certain events or ships. “We are not going to respond and act the way we did before 9-11,” Vice Adm. James Hull of the U.S. Coast Guard told ABCNEWS. “We are going to be more aware, we’re going to know what our vulnerabilities are. Recreational sailors can’t do everything they did before.” One boater, asked if he knew how close he could get to a Navy ship, shook his head and laughed. “Not close,” he said. Not just Navy ships are off limits. There are more than 100 safety zones — around nuclear power plants, cruise ships and military piers. And boaters can no longer anchor under bridges or in channels. They can be fined or arrested. As the boating season officially gets underway, the estimated 70 million Americans who will take to the water this summer will have to get used to the new rules — rules designed to prevent terrorist attacks. With reports of increased threats of a terrorist attack on our shores, the United States Coast Guard is requesting the assistance of America’s 70 million boaters and others, who work, play, or live around our waterfronts, rivers, lakes, and coastal areas to become part of our nation’s first line of defense, called America’s Waterway Watch (AWW). America’s Waterway Watch is an outreach program akin to neighborhood watch programs in many local communities but is focused strictly on marine-related areas. With over 95,000 miles of shoreline, 300,000 square miles of waterways, 6,000 bridges, 360 ports of call, and thousands of marinas, the United States Coast Guard simply cannot be everywhere at once. We need all the eyes and ears of those who frequent our waterways to be on the lookout for suspicious activities that might threaten our homeland security. The AWW program has a central phone number, 1-877-24-WATCH (1-877-249-2824), where the public can report suspicious activities. This information goes to the National Response Center located at U. S. Coast Guard headquarters, which is staffed 24 hours a day, seven days a week. If what’s seen poses an immediate threat, boaters should call local authorities by dialing 911, or the U.S. Coast Guard on Channel 16 of their VHF-FM marine radio. If someone sees something that looks suspicious, boaters should call the AWW toll-free number. The AWW program is already working. 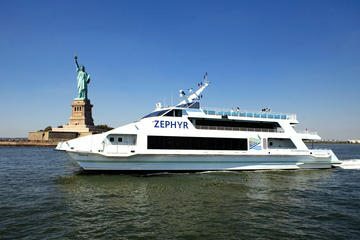 For instance, Sayed Abdul Malike, a suspected terrorist with known connections to Al Qaeda, was apprehended back in 2003, based upon a tip from a local charter boat captain. 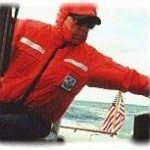 Your local Coast Guard Auxiliary unit has several promotional tools to help spread the word including an AWW decal for the helm of your boat, a wallet card, poster, brochure and a video that marina owners, operators, or other presenters can use to educate their residents, tenants, or customers. For more information about America’s Waterway Watch, visit www.americaswaterwaywatch.org.